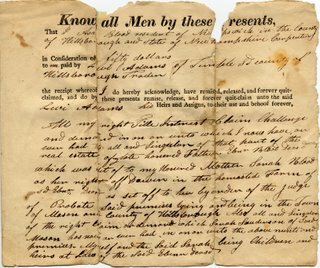 This deed was found among items formerly belonging to my great grandmother. 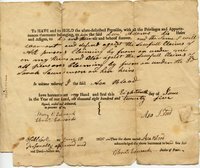 The deed is for a property in Mason, NH being transferred from Asa Blood to Levi Adams. It is believed that this deed was in the possession of her husbands grandfather John Simon. John Simon was married to Sarah Russell Blood; they lived in Salem, MA. John was from France (more on him later); Sarah (b. 6/18/1786) is believed to have been from Mason, NH. She died in 1831 shortly after the birth of their last child, upon which it seems her husband John Simon took ownership of a farm in Mason. This deed may be for a portion of that property or of a neighboring one. The follwoing information is true of the family that I believe is Sarah's (based on other information to be posted later). Sarah's father was Thomas Blood of Mason (b. 3/6/1759, Rev. War Soldier, d.3/6/1759) . He had siblings: Ebenezer (b. 5/14/1757, taken at the Battle of Bunker Hill), Asa (b. 9/28/1763), Sarah (b. 12/1/1766), Naomi (b. 5/13/1773), and possibly Cynthia. They were all the children of Ebenezer Blood and Sarah Fisk. The deed is believed to refer to this Asa. The daughter Sarah, mentioned above, married first John Sloan, and second Saunderson; she is mentioned on the second page of the deed as Sarah Saunderson. 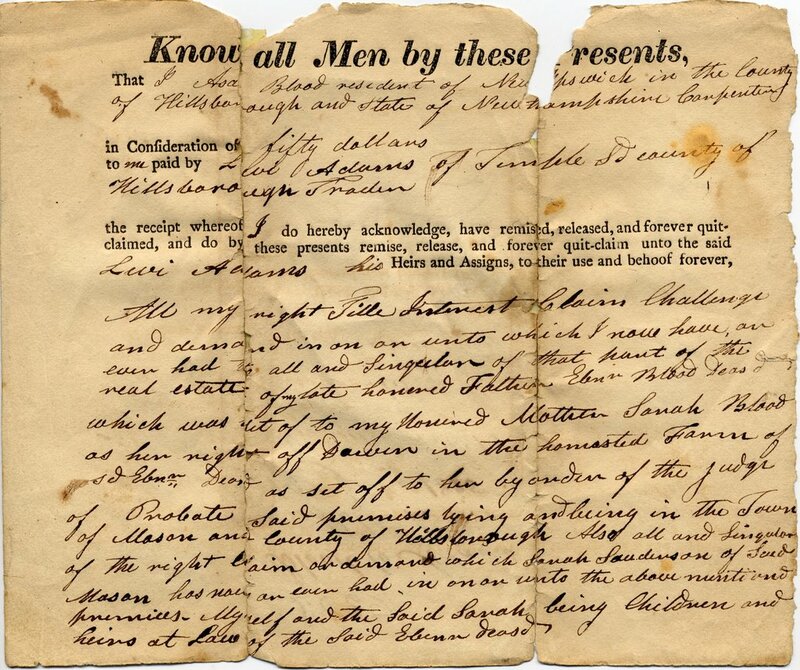 The back of the second page states it was recorded June 19, 1825 at Hillsboro NH in Volume 145, Page 213. 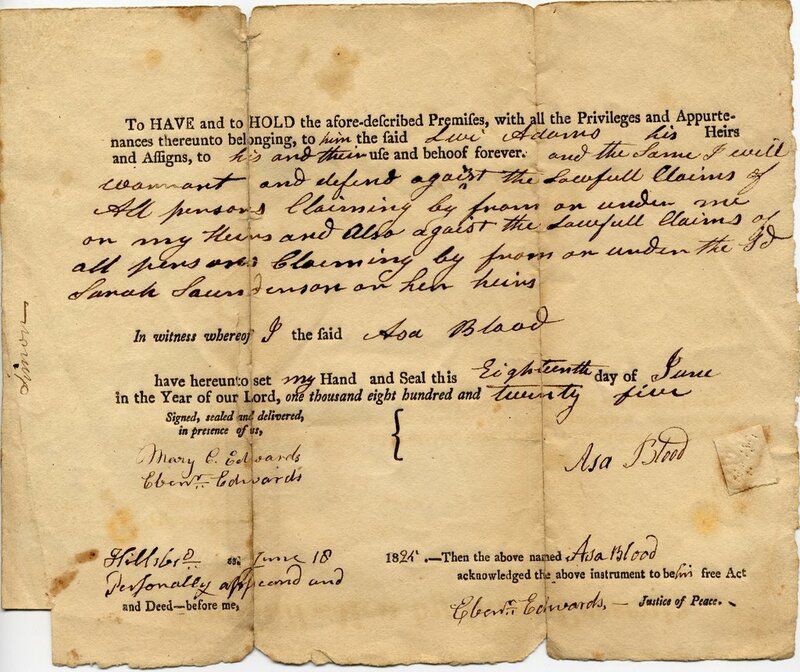 I have copies of two letters written by Asa Blood b 1763, son of Ebenezer and Sarah (Fisk) Blood to his son Hervey Blood, and the signatures resembles the signature on this deed. I believe you are right in saying that this was a deed from Asa Blood of Mason, NH b 1763.